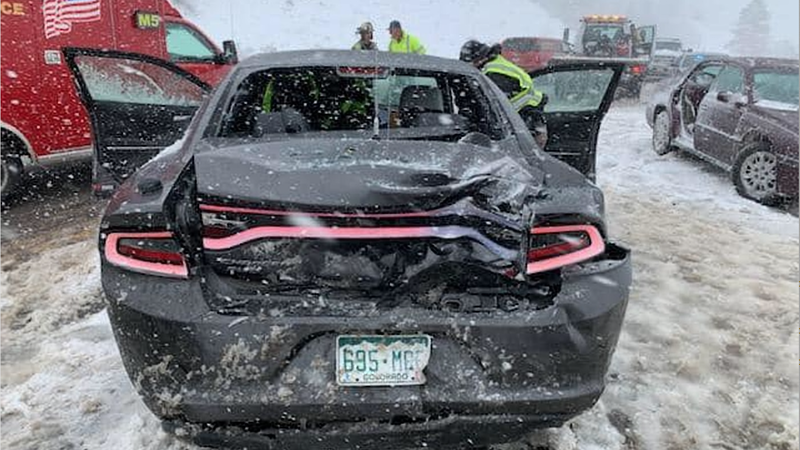 A ferocious and sprawling spring storm is dumping heavy snowfall on the central U.S., leading to paralyzing blizzard conditions from northeastern Colorado into extreme southwestern Minnesota. Why it matters: This is the second intense, large storm to strike the central U.S. in a month. The first one, which qualified as a bomb cyclone due to its rapid intensification, led to at least $4 billion in damage, mainly from widespread flooding. One major concern centers on what happens after the storm abates, as the new snow cover will melt in an already flood-ravaged region. The National Weather Service expects records to be set for snowfall and for the lowest atmospheric pressure reading observed during the month of April in particular states. The agency is also warning of major flooding to follow the storm as the new snow cover melts into already swollen rivers. The latest: The National Weather Service issued blizzard warnings for 6 states as the storm peaks on Thursday. "Farther south, destructive winds, blowing dust and critical fire weather continues for the southern Plains," the National Weather Service said. "Severe thunderstorms will threaten eastern Illinois and western Indiana Thursday." Numerous major interstates have been closed due to blinding snowfall whipped up by 40–50 mph winds. Illustrating the storm's reach, yellow or brown-tinted snow has been falling in Minnesota due to dust entrained into the storm from its southwest flank in Texas and New Mexico. Among the hardest hit regions is South Dakota, where there have been power outages and roads closed. Snowfall accumulations there have already topped 18 inches. Thundersnow has been observed in South Dakota and Nebraska, which indicates the storm's potency. Some states, like Minnesota, may see several precipitation types at once, from rain in the southeastern part of the state to hail in severe thunderstorms, as well as sleet and snow in Minneapolis and wind-driven snow in the west. In Colorado, a 150-mile-long stretch of Interstate 76 was closed from northeast of Denver to the Nebraska border, according to AP. To the southeast of the low-pressure area, in the storm's so-called "warm sector," severe thunderstorms are occurring, with the chance of a few tornadoes on Thursday.